As one gets older one also gets adjusted to certain comforts! We have decided to purchase a bigger airbed that is also raised and doesn't cost a fortune. Bingo! My partner actually said it was more comfortable then our bed at home! Yes, the air was going a bit each night but it didn't bother me that much, we just pumped it every night before bedtime (let me point out that we did not wake up on the floor in the mornings, the bed was a bit softer that's all) Overall definitely good purchase. Nice big air bed with enough room for kids to come in for a cuddle in the early morning! Some roll-together though - would be perfect if the two sides were separated. Used electric pump to inflate quickly and then topped up with foot pump. Tough enough to withstand kids jumping on it. But too big for many tent compartments so check sizes carefully. 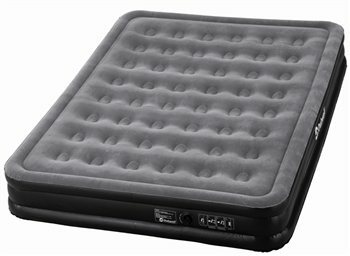 This airbed was fully inflated in under 2 mins using our electric air pump. Big enough for 3 teenagers to share making sleepovers far less hassle! Great. Good value for money. Super fast delivery. Excellent. Great airbed. High quality and VERY little air loss. Refilled a little air after first week. I am 185cm and 125kg, no drama and very comfortable!I would without doubt recommend this product.